An important scientific paper by Albert Einstein has sold as one of the top lots in Profiles in History's Historical Auction, held on December 16 in California. The draft shows the development of Einstein's unified field theory, an important finding of his career. Estimated at $120,000-180,000, it sold for $150,000. The draft was likely created in 1930 as a follow up to Einstein's presentation at the Prussian Academy of Science. 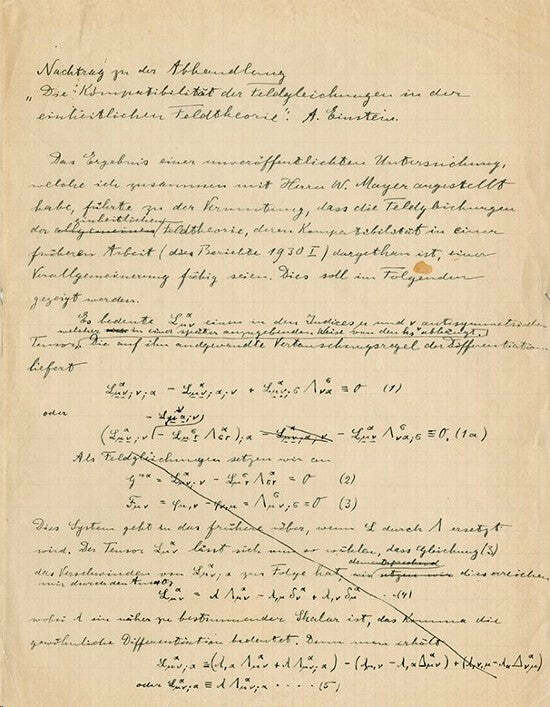 It contains an analysis of the field equation of the unified gravity-electromagnetic system, as well as two pages of "cheat sheets" that Einstein may have used to give him quick access to the most relevant formulas. It also shows Einstein's close collaboration with mathematician Dr Walther Mayer, who was known as "Einstein's calculator". Einstein memorabilia sold well, with an autograph letter describing his life among the scholars at Oxford University making $12,000. Einstein writes in his typically charismatic style: "The inhabitants here are cowards enough to go into hiding only to, eventually, come out for vicious attacks and to then retreat into their little refuge. Thank god I am a different type of guy with my little study, a knight without fear, but not without reproach! "There is a lot to be observed here which is historically sacred and which feels crazy. Everyone honors these things but always with a quiet smile. Even God has to endure being treated in the same way," he adds. Paul Fraser Collectibles has an Albert Einstein signed letter for sale.